The awesome part is that the blackberries were from my garden. And the other awesome part is that one of these jars is going in Daisy's growing stash of Items to Enter in the County Fair. Daisy, if looks count for anything you'll do well, those look like rubies in a jar. 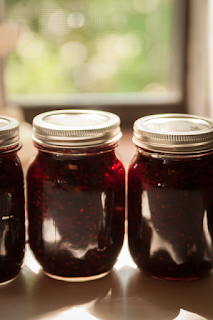 I am seriously impressed that you can make jam already. Good luck at the Fair! Rose, I do wonder how the jams are judged, since they aren't opened or tasted by the judges. It may be just looks. Blackberries already? So jealous. There's something so cheery about colorful jars of jam lined up in a row on the counter, but my favorite is hearing them "pop" as the lids seal! I am seriously impressed! I let my kids loose in the kitchen, but canning is not something they or I have thought they could take on. Lisa, we just use the instructions in the box of Sure-Jell. Except that we cook it until it starts to sheet when dripped from the spoon. NOT the Exact One Minute the instructions say. My goodness, I have never made jam! Except freezer jam. Daisy, good for you, honey! Blackberry jam is my favorite jam. Congrats to Daisy because these jars look so pretty. Will she be making her own labels also?